I've been struggling for space in my garage for a while now. I couldn't make my mind up how to create space but keep the bikes I have (they're not all mine) secure and undamaged. Having tried other options, I was still open to suggestions - so when the opportunity came along to test the Cycloc Hero I was certainly keen to have a look. Cycloc Hero: a simple and discreet bicycle storage solution. 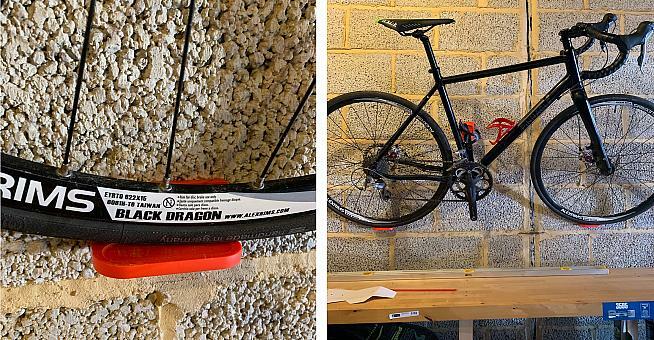 I'm all for simplicity whilst retaining all the functionality you would expect from a product that can elevate your bike to a height that suits your needs. It doesn't complicate matters, as space to store bikes can often be at a premium, hence the need to improvise. Well with Cycloc you can, their range will provide you with a solution to meet your needs. There are seven colours to choose from, so you should be able to colour co-ordinate your storage fittings. The Hero turned up, neatly packaged in a small box. On opening, you discover the installation process is as straight-forward as the concept. Three pieces of robust plastic designed to be simple as a premise and install. Two-foot plates to support the wheels whilst the third, larger piece has been designed to hold your pedal. With a width of 60mm and a height of 74mm, it will take most pedals with the exception of Speedplays (a separate Super Hero system is available if you run Speedplays). The other advantage is the bike will lean out at approximately 20 degrees from the wall, so another bike can be mounted on either side. All about the simplicity and ease of use. Next and crucially, it was time to install the Hero. 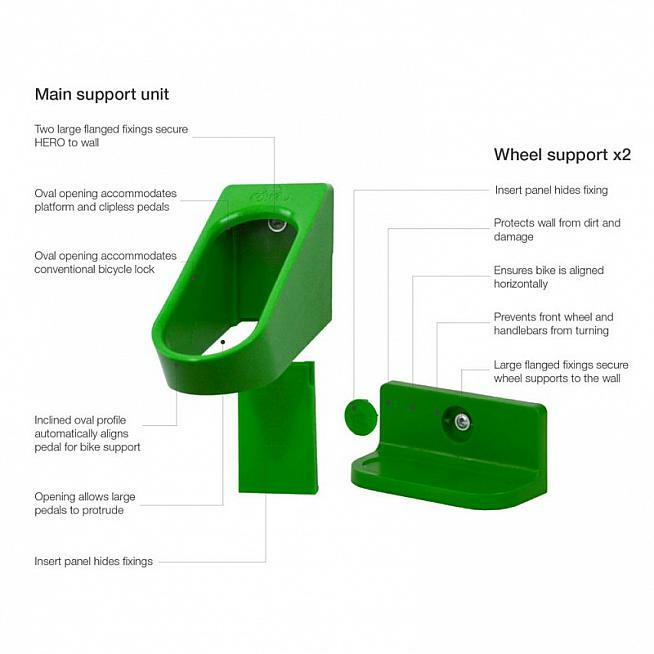 The two supports for the wheels are fixed by a single wall plug and screw. This hardware is provided, and gives plenty of depth, so you don't have to worry about the fixings being securely fitted. The oval-sized cut out that supports the pedal would also have enough room to attach a lock should you wish. The plastic is robust, made from Polypropylene so will hold your bike without concerns of not being strong enough. The instructions included were easy to follow. If you want more in-depth detail, the PDF on the website has you covered. You don't need to be a DIY wizard for this one, it's easy as making a hole in your wall. Having worked out what was going where, I marked the spots on the wall and drilled a couple of holes for the wheel supports. Once they were deep enough for the wall plugs, they were inserted and with the flange fittings felt very secure. Wheel units in place and screwed in securely had taken 5 minutes. So far so good - I've found with previous DIY jobs to never count your chickens too early! Next phase was to line up the wheel supports with the pedal support at the right height. As the bike was being mounted higher up the wall this was a little fiddly but of my own making. It had seemed like a good idea placing the bike up high, but I also wanted to see how secure the whole thing would be. Potentially a risky test if you come in to find your pride and joy on the floor. Measurements taken, re-checked and it was time to drill some holes. 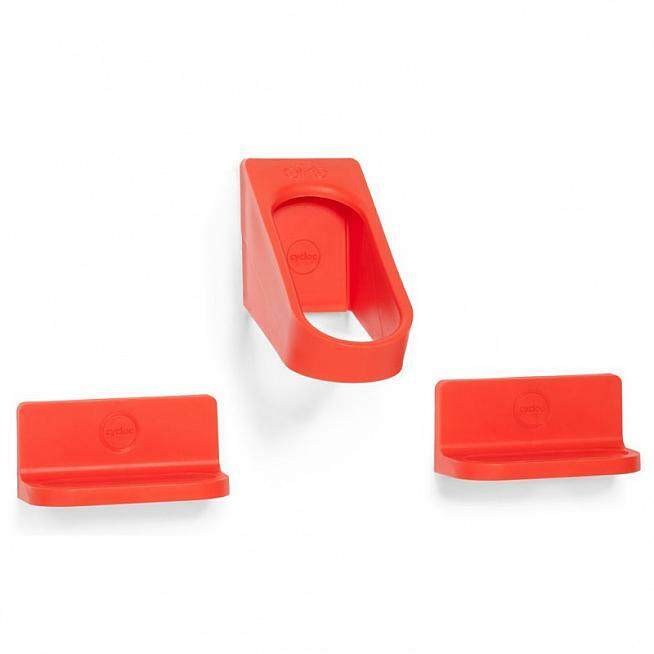 The pedal fittings have two screws to secure it to your chosen surface, top and bottom. There is a template provided in the package, so working out where the holes go is simple once you have your position sorted. Making sure the screws were fully secure was a little fiddly as the top of the fitting is a little tight but after a bit of an effort, everything was in place for the final test - the bike. Before getting to that part, a step back to survey my handiwork reveals that the Hero is very unobtrusive. Three small fittings on your chosen surface that you'd barely notice. Add the bike, and you could have a centrepiece to become part of a conversation with guests or visitors - that is, if you host them in the garage. That moment when you realise you left your girlfriend behind at the feed stop. Voila. Job done and in double quick time: less than half an hour to mark out and install. Everything was securely held in place, no wobble or hairy moment when you think it is coming down. Overall, I would have to give the Hero top marks. Cycloc have taken a potential headache - how to store your bike using the space you have efficiently - and made the whole process really simple. 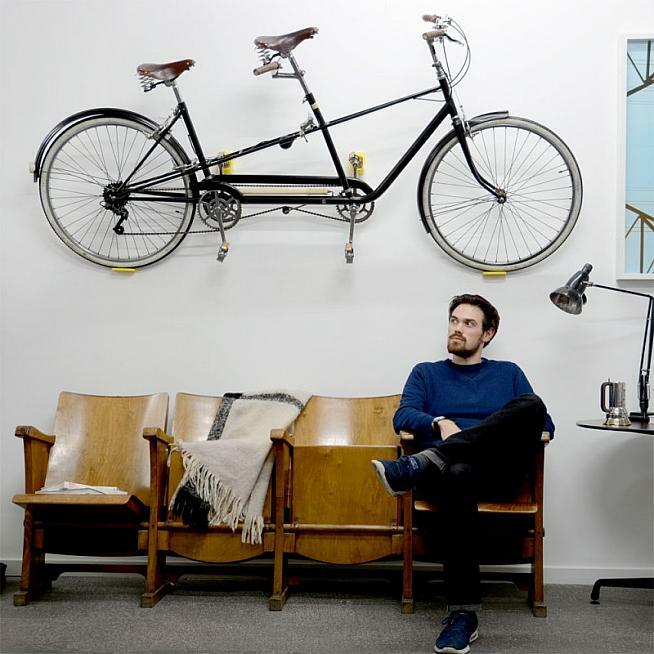 Plus, you have the satisfaction of your bike becoming a centrepiece of whatever room you decide to keep it in. With a variety of bold colours and additional fittings, you're likely to find an option to suit your bike and decor. A quick word about the price: Cycloc sell the Hero for £44.95, but it can be found on various online retailers for under £40 which seems more reasonable. So shop around for the best deal - and remember, you're gaining a couple extra square metres of floor space. Cycloc Hero, £44.95 from cycloc.com.